shape incorporating a unique waffled ischial relief recess,and an innovative reversible outer cover. Durable HR (high resilient) foam prevents "bottoming out"
Innovative reversible outer cover, Dartex fabric,may be used smooth or fabric side out to suit individual needs. 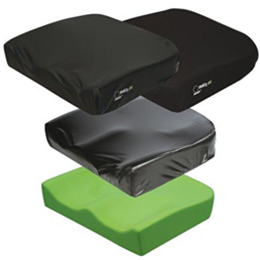 Recovery inner liner provides moisture protection to the foam. Waffled recess provides ischial/sacral immersion and helps maintain pelvic position and prevent sliding. Also available in Heavy Duty sizes.